It is the 200th entry on this blog, so what to do to celebrate? 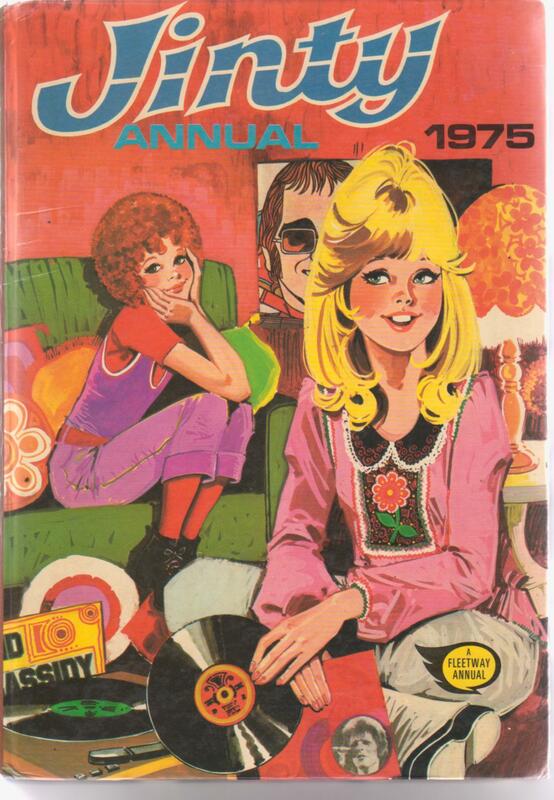 Well, The Best of 70s Girls’ Comics Annual reprinted the cover from the 1975 Jinty annual, so it seems appropriate to now take a look at the annual itself – which is in fact the first annual Jinty produced! 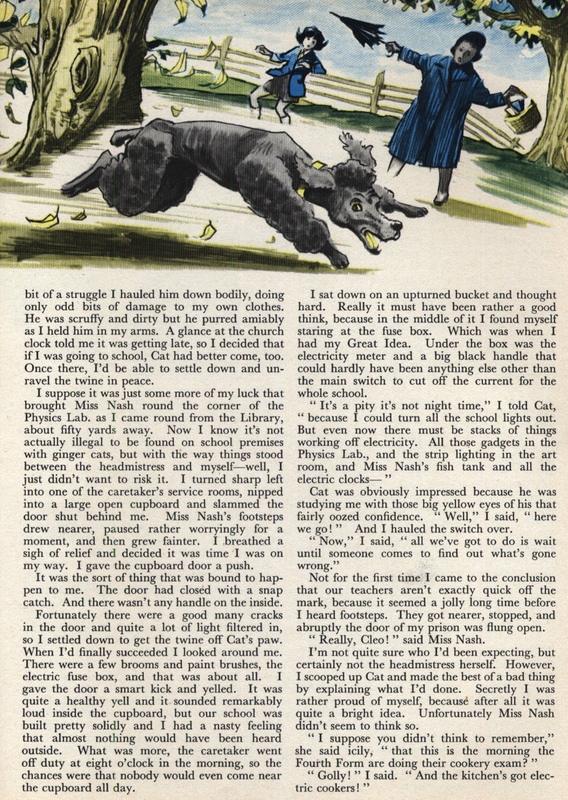 Jinty herself appears on page 124, saying it is the first-ever Jinty annual and she was granted the right to be the first person to read it. But ye Editor suddenly realised he forgot to include Jinty herself in it and had to take fast action to redress the oversight. So Jinty appears on page 124 rather than page 1, with Gary Glitter himself! What a way to make it up to her and give the readers an extra treat! 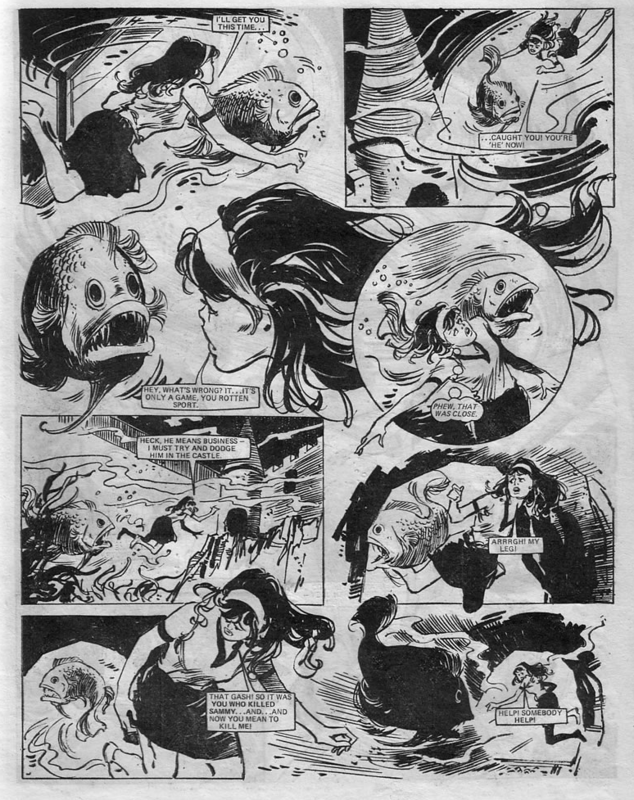 The annual has six text stories (oddly, one of them, “Mystery of the Devil Dancers” actually credits the writer, Linda Blake), six picture stories, at least ten features, and the regulars are The Jinx from St Jonah’s, Dora Dogsbody, The Snobs and the Scruffs, and Desert Island Daisy. The last two are unusual because they were the most short-lived features from the original Jinty lineup. 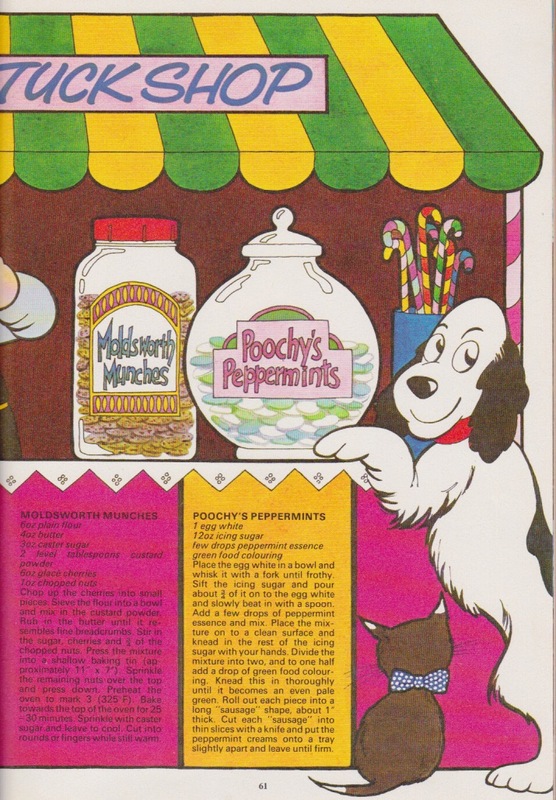 And Daisy actually appeared in two Jinty annuals after a short span in the regular comic. 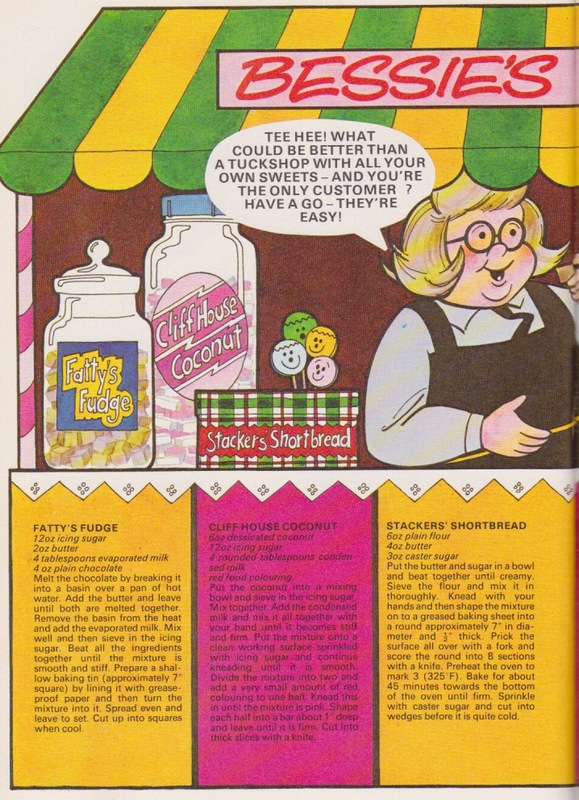 By contrast, Merry from Misery House, one of the longest-running stories from the original Jinty lineup, did not appear at all in the annuals. Perhaps Jinty was aiming for more lightweight features with her annuals. Or perhaps Merry was regarded more as a serial than a regular and therefore did not qualify to appear. 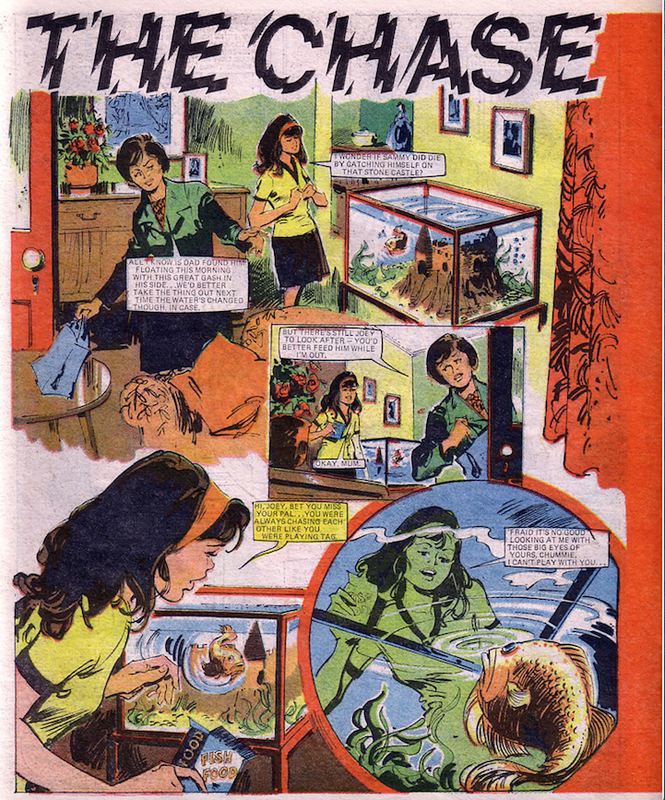 Dora Dogsbody is drawn by Jim Baikie instead of her regular artist, José Casanovas. 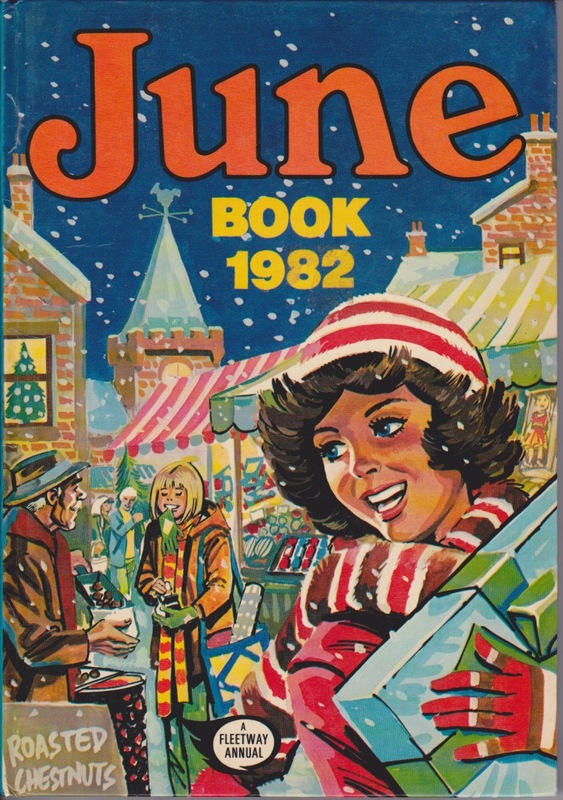 In fact, this was the case with all the annuals Dora appeared in. 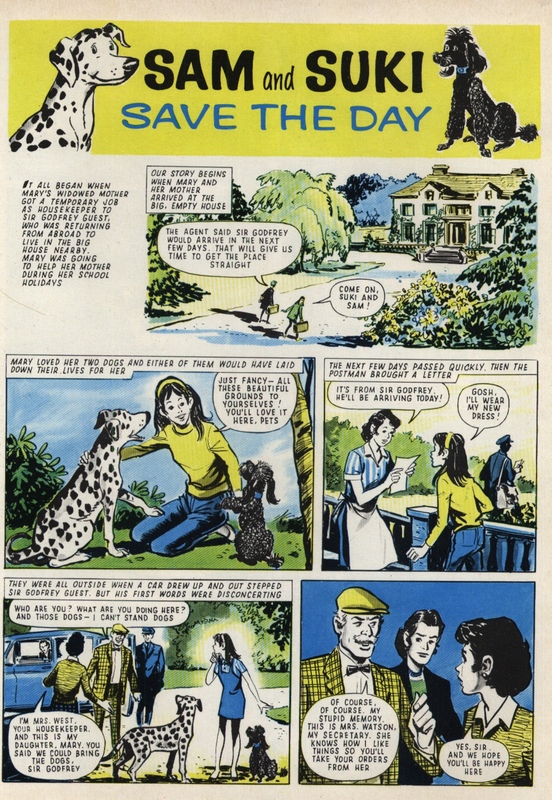 Do-It-Yourself Dot, the longer running of Jinty‘s funnies, makes no appearance while the short-lived Snobs and the Scruffs does. Another oddity in the lineup. The Jinx from St Jonah’s retains her regular artist, Mario Capaldi. Katie is unsure about joining the latest roller-skating craze at school because she is klutsy enough on her own two feet. The prospect of being selected for a roller-skating/swimming show decides the matter. Katie sure is determined to get into the show, but will her jinxing wreck her hopes – or the show, maybe? 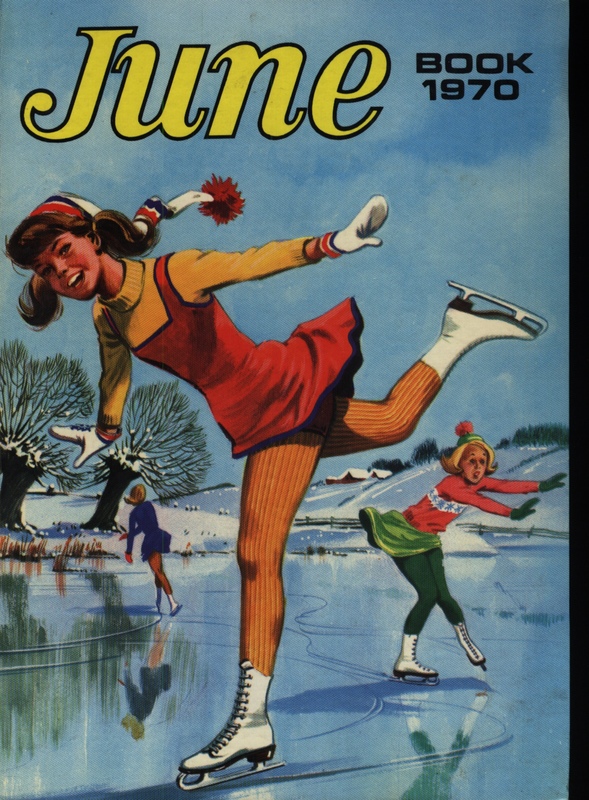 Or will Katie land on her feet somehow, skates and all? 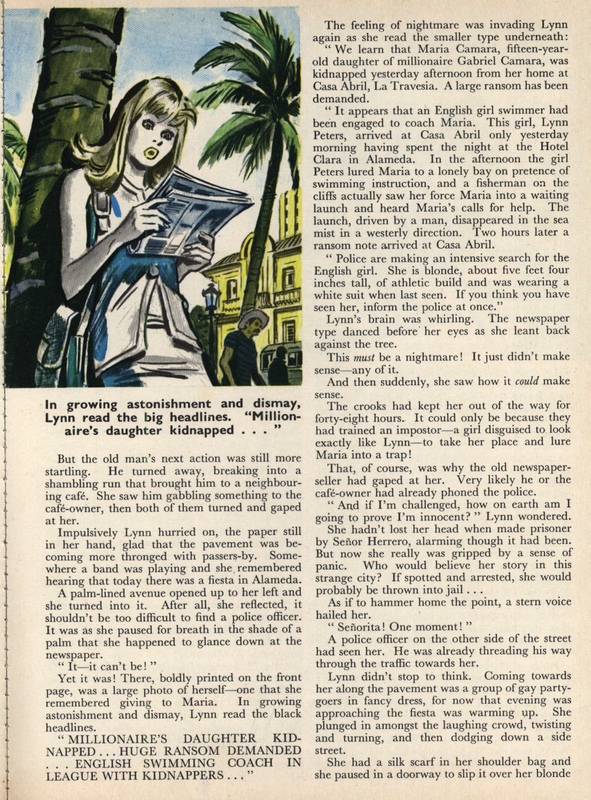 As was frequent with young IPC titles, the annual reprints material from older annuals as she was not old enough to reprint her own material in the annuals. 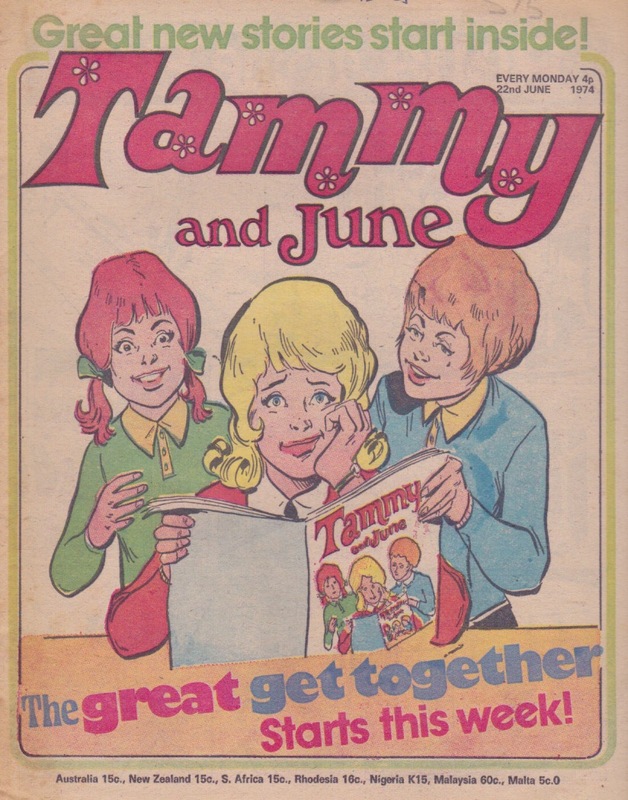 The early Jinty (and Tammy) annuals reprinted a lot of old material (some of it under revised titles) from June, and this was very likely the case with “Four on the Road”; there can be no doubt it was originally a serial, and it may or may not be appearing under a revised title. The story concerns two orphaned Italian children Lola and Toni, who are faced with an orphanage after their grandfather dies. Then their adventures begin when their landlord, Signor Borani, has the children collect two dogs and then they get stranded, forcing them and the dogs to take the the road in order to deliver the dogs to their new owner. 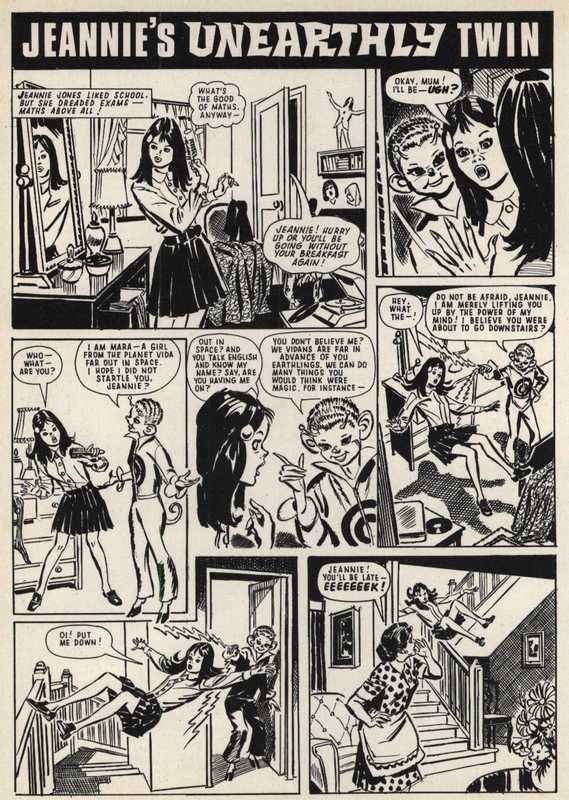 Update: I have found that “Four on the Road” originally appeared in Sally. 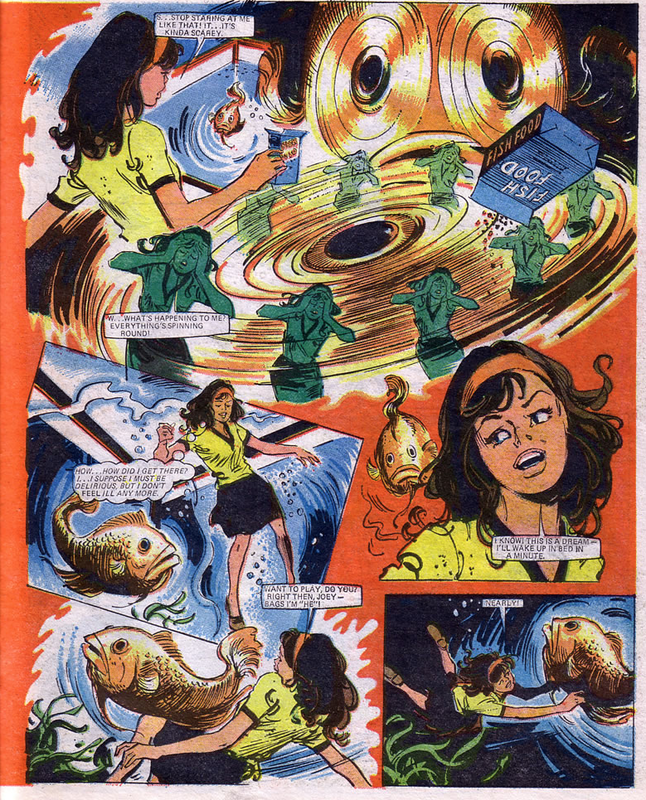 One text story, “Holly Takes the Plunge” was ironically reprinted in the last Jinty annual in 1986. Talk about bookends. Some of the shorter stories such as “Eve’s Dream”, “Starlight Saves the Train” and “Shirley Finds Her Feet” may be reprints from older sources as well, because they are not drawn by Jinty artists. “The Helping Hand” and “Date with a Dreamboat” may be Jinty as they are both drawn by regular Jinty artists. The former is an intriguing story about a student nurse who is struggling with her training until she gets help from a strange character dressed as a jester. Then she sees the same jester in a portrait and discovers he founded the hospital 800 years ago. Someone playing a joke or did the founder return to help the nurse? Whatever the truth, Jinty seems to be stretching credibility a bit with a jester founding a hospital – even if he did persuade the king to grant him the land for it. All the same, the story is fun to read. The latter, quite surprisingly for the times, is a boyfriend-themed story. Claire takes a fancy to Tom, but soon finds herself in a love triangle with Susie – Tom’s boat! 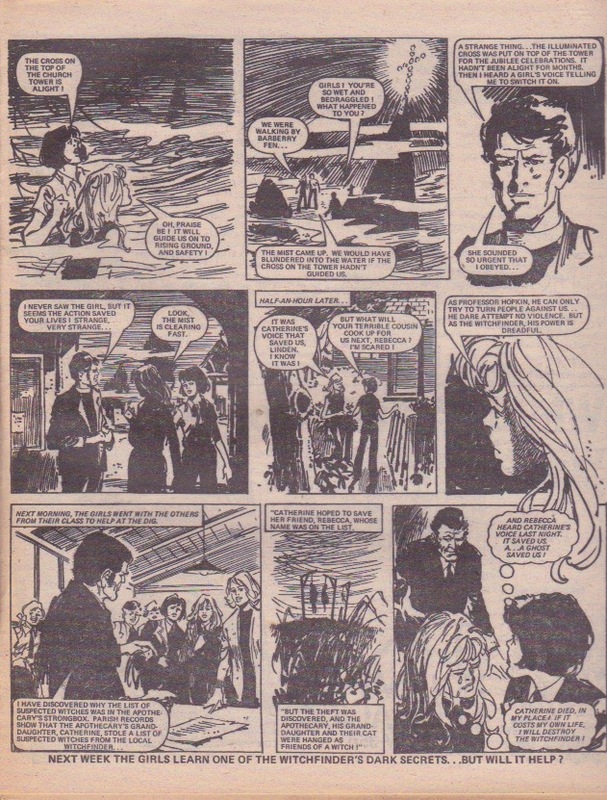 And Susie seems to be just as unhappy with the situation as Claire when Claire joins Tom for a sailing in Susie. But of course things work out in the end. 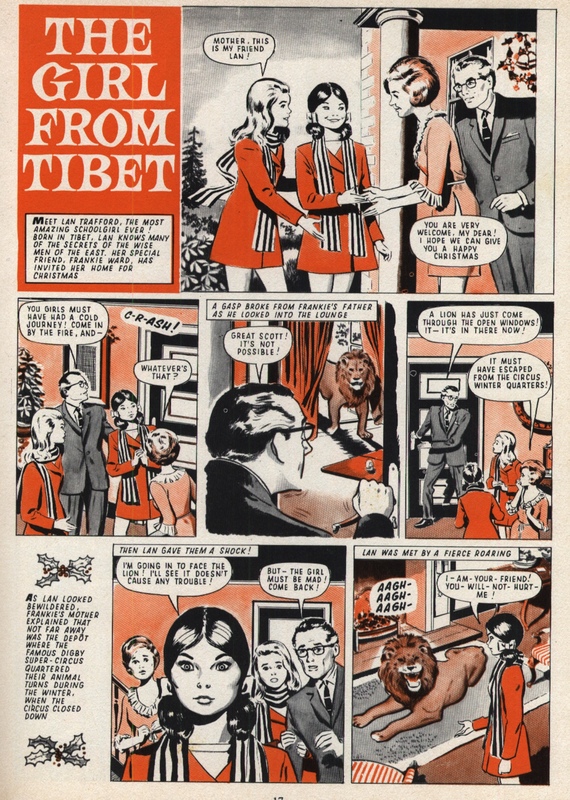 The first Jinty annual can be regarded as an enjoyable read. 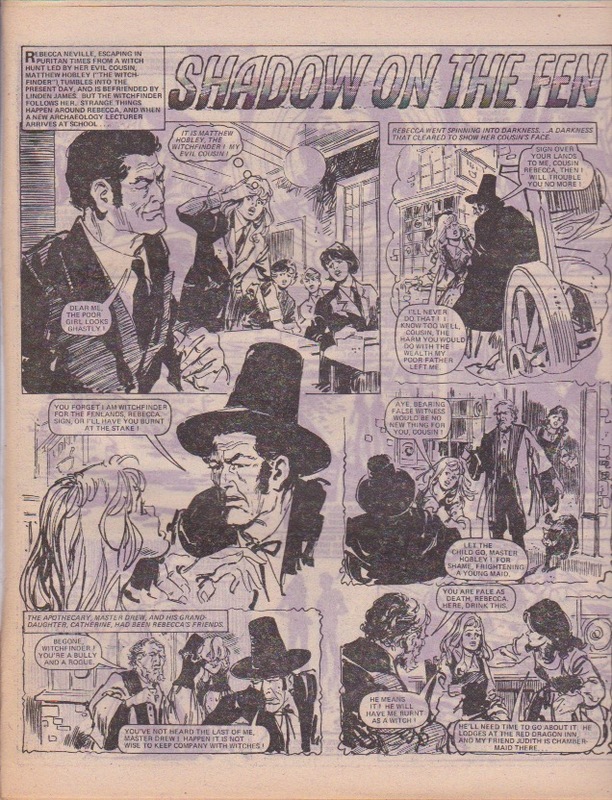 It cannot be described as having a full Jinty feel as it is a mix of Jinty stories (some of which are a bit surprising) and reprints of older IPC material. But that is understandable as Jinty was still getting established and did not yet have enough material to fill her annuals with her own material. 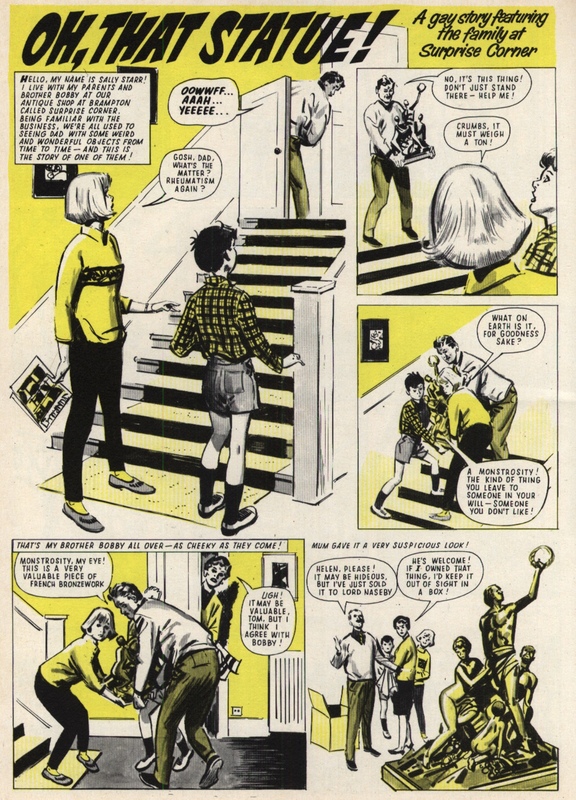 It is a good start to the run of Jinty annuals that would sadly end on a whimper. 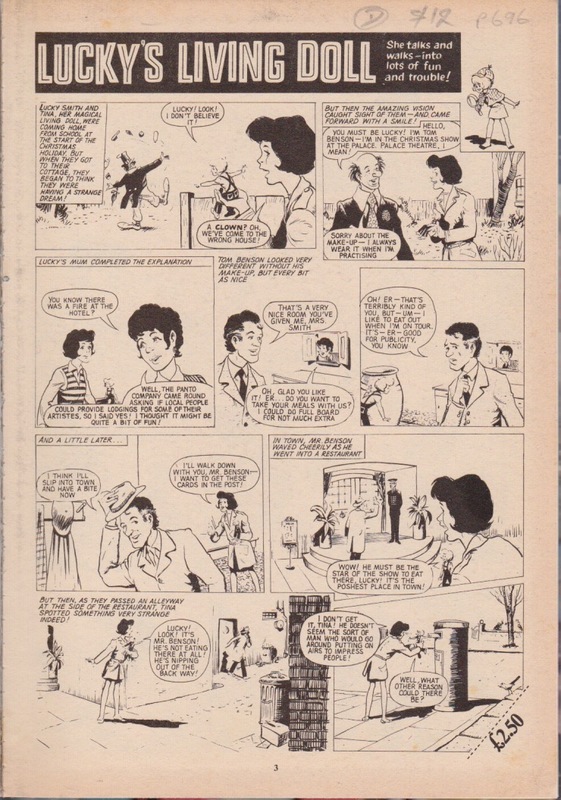 The last two Jinty annuals were Jinty in name only; they were just a collection of reprints from older comics and not a trace of Jinty material anywhere.